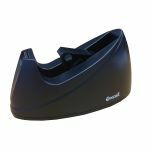 Our useful desktop tape dispenser is ideal for general office and home requirements, especially useful as a packing tape dispenser. It’s so easy to wrap packaging with our non-slip tape dispensers which allow you to pull and cut the tape with one hand – you don’t need to scrabble around for scissors and you save your precious teeth into the bargain! We have two widths of our heavy duty tape dispenser, suitable for 25mm and 50mm wide adhesive tapes. Each desktop dispenser is sturdy yet economical and reliable, with a good blade of serrated metal for quick, easy and clean cutting. 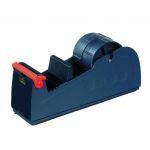 Our pull-and-cut countertop tape dispenser has a heavily weighted rubber base to avoid slipping or scratching your desk top. It dispenses a wide range of adhesive tapes smoothly and cleanly for more secure yet presentable packages and is the perfect time-saver when wrapping Christmas presents or if you have a big order of parcels to dispatch quickly. Our parcel tape dispenser is perfect for a wide range of tapes too, as it comes in 25mm and 50mm widths, thus making it flexible and long lasting. Both tape dispensers have a sturdy non-slip base and are easily manageable with their one-handed dispensing. Both are tough and will withstand the impact of being dropped as the 25mm version is made from durable plastic with proven resistance to impact while the 50mm heavy duty tape dispenser is made from metal. You’ll find our packaging tape dispenser is reliable, convenient, practical and simple to reload. No more hunting for scissors – it’s hard to lose this office tape dispenser with its permanent core. Boasting contemporary design, our adhesive tape dispenser is made with durability and convenience in mind and is suitable for a wide range of tape dispenser needs. Thanks to its pull-and-cut feature, our heavy duty desktop tape dispenser is a practical and economical choice. Say goodbye to scissors or knives and say hello to our no-mess and quick cutting adhesive desk top tape dispensers.